Homes built to code sit on a slight slope to help guide the runoff water away from the foundation. If your roof doesn’t have gutters, the rain will flow right off the roof and cause massive amounts of erosion around your house. Every time it rains, more earth will get washed away. Your landscape will start to wear down and the runoff will flow into your home instead. The erosion allows the foundation to settle and you might start noticing cracks, uneven floors, and other issues. Many homeowners landscape around their house to give it a heightened curb appeal and the perfect finishing touch. If your soil erodes because you don’t have gutters, the landscaping will be the first thing to go. Even minimal water in the wrong place can form puddles and kill plants and flowers. When your soil is saturated with water it becomes heavy around your house. This can easily happen when all of the rainwater from the roof is directed down. This puts a lot of pressure on the foundation of your home which could cause the walls to push inward and crack. Even tiny cracks can allow water to flow into the basement. Even if it doesn’t appear to be a lot, the moisture can grow mold, which is a huge health hazard. 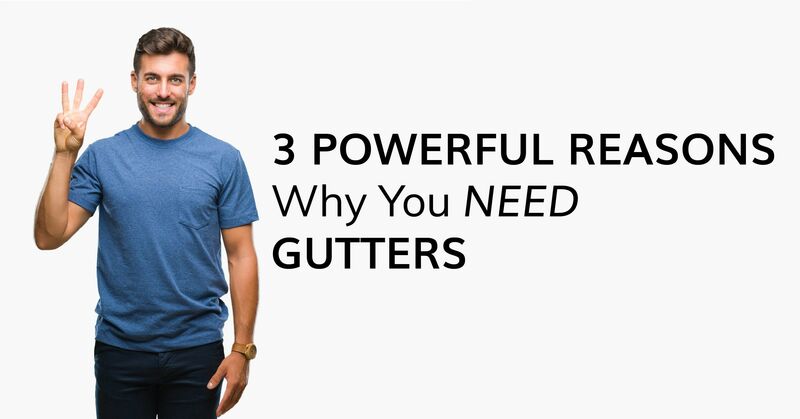 There are plenty of other reasons to attach gutters to your home, but these three are enough to get you started finding the right options. You certainly don’t want erosion and flooding issues in your home. When you’re ready to look for the right gutters to care for your home, contact J. Carnes & Son Roofing. We custom fabricate seamless K-style gutter systems on site using Englert .032 metals and accessories. So whether you’re looking for a new roof installation, seamless gutter system or both, we’ve got you covered!